Where do I even start in my love for this book? Seriously. 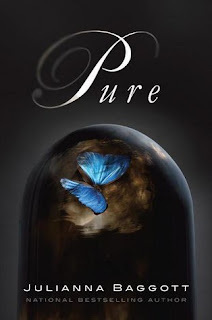 I picked up Pure on a whim, on a hunch that the cover was holding something immensely interesting, and I was dead on. Julianna Baggott doesn't just rehash the same old dystopia that is thrown around so often in young adult fiction. Far from it. What you'll find here, hidden in the pages of Pure, is a romp into the gritty and very realistic lives of those who survived the Detonations. It isn't pretty my friends, but it's fascinating. Pressia's dystopian home is imagined and described beautifully. Baggott lures the reader into a world that has been torn apart. Whole towns leveled to the ground. People who are fused to inanimate objects, or worse yet, their own loved ones. What really comes through more than anything else here is the haunted existence that these survivors live. They've come to terms with who they are now, but so many of them cling to their remembrances of the "the Before" to stay sane. Those who survived only did so because they gave up a part of themselves. The hurt, the anguish, the spark of survival, Baggott shares it all with us through this dark and desolate world she puts her characters into. In terms of the characters, I really enjoyed them all. From the main character Pressia, all the way down to the normal townspeople, each character is built lovingly and realistically. Pressia is a character who is hard not to fall for. Despite her self acknowledged flaws, she won't give up on herself or her companions. When things get tough, we meet Bradwell and Partridge. Bradwell is the epitome of what a survivor is. Never getting too close to anyone else. Until, that is, he meets Pressia. Partridge is a gorgeous mirror to the ugliness that surrounds Pressia and Bradwell. With his perfect clothes and skin, his enhanced DNA, he becomes the odd man out. However it is only by working together that these three can ultimately save themselves, and those around them. I'm rambling I know. That's how much I enjoyed Pure. So much that I can't quite put into words how much I loved it. The action in this book is copious, the world is beautifully built, the characters are strong and lovable. Everything about Pure is new, refreshing and amazing. I've read dystopian fiction. I love dystopian fiction. It is because of this that I can say that Pure far outshines everything else I've read in this genre so far. If you are okay with a bit of grit in your reading, pick up Julianna Baggott's new book and prepare to be sucked in.